Deposit your checks anytime, anywhere through the UKRFCU App. Convenient – Although we enjoy seeing your smiling face, save a time and avoid trips to the branch. Simple – Make a deposit with just a few taps and camera snaps from your Mobile app. Free – Use our free app to make free deposits to your Share Draft. Login with the UKRFCU mobile app. Select Check Deposit icon. First time login, Read and Accept the disclosure and agreement. Verify the back of your check is endorsed with your signature, your account number and “FOR UKRFCU MOBILE DEPOSIT ONLY”. Select the account you want to deposit the check into. It will automatically select To Share Draft. Enter the amount of the check (daily and monthly limits apply). Select the Camera icon to take a picture of the front of the check. 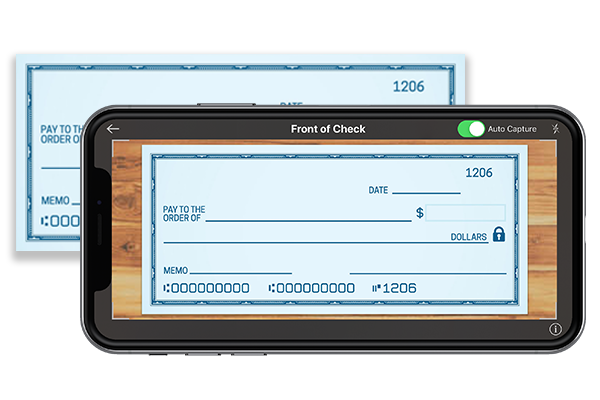 Let the Auto Capture to take the picture of the check or tap to take it manually. You can Retake picture if it’s not legible or keep picture. Tap to take a picture of the back of the check. Click Deposit. You may be prompted to confirm the amount of the deposit. Deposit confirmation will be sent via email. Deposits made before 4:00 PM EST will be posted the same business day. Deposits made after 4:00 PM EST or on holidays and weekends will be posted the following business day. UKRFCU Funds Availability applies. Available within the UKRFCU Mobile App. UKRFCU funds availability policy applies to mobile deposits. After depositing the funds to the UKRFCU account, a member may use Online banking to make a loan payment. Remember to update the UKRFCU app on your mobile device to see the new Check Deposit feature. Endorse the back of the check with your signature, your account number and write “FOR UKRFCU MOBILE DEPOSIT ONLY”. Keep hands clear of the check while taking the pictures to avoid pictures of fingers/hands. Hold onto the check for 60 days since deposit. Download the UKRFCU Mobile app to use Mobile Deposit. Please click here for full terms and conditions.